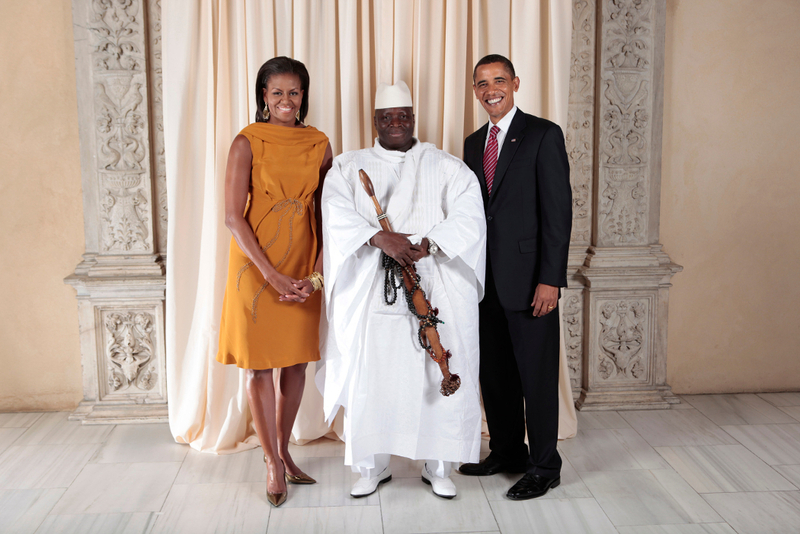 President Yahya Jammeh and Mr. & Mrs. Obama of the U.S. The Gambian president appeared stupefied about how Mr. Lamin Sanneh, who is said to have led the attack, and who had left the country not long ago, could get financing to stage an expensive terrorist attack on Gambian soil. He said there are countries who always talk about being friends of the Gambia, but said what they have seen now must become clear to every Gambian that those countries are not friends of the Gambia. Gambian president, Mr. Yahya Jammeh, in an interview with GRTS’s Kebba Dibba has said that contrary to media reports, a failed attack at the State House was not a coup attempt against his government. He said it was an attack by dissidents trained and nurtured in the United States, Germany and the United Kingdom. President Jammeh attests that all the weapons and some of the materials, including grenades and bombs, used in the attack were made in the United States of America. He said the attack was well planned and the strategies uncovered were comprehensive. He added that it took a Gambian special task force to unearth the treachery. President Jammeh said the dissidents had a three tiered attack strategy. The nature of the plans were uncovered from discarded computers left behind after the coup was foiled by Gambian National Forces. Some of the information he said were disturbing but he has promised to release the full contents to the public in due course. The Gambian president exonerated and applauded the Gambian Army describing the force as a very loyal one – committed to the integrity of nation building in Gambia. There was no Army officer involved and the Gambian press has also largely referred to the attack as a terrorist plot instead of a coup attempt. Most retail media in Gambia have picked on President Jammeh’s insinuations that the attack was led by a group backed by the United States especially. The Gambian president said there are countries who always talk about being friends of the Gambia but said what they have seen now must become clear to every Gambian that those countries are not friends of the Gambia. President Jammeh said they uncovered evidence that the attackers relied heavily on the armed forces joining in on the plot. A calculation which obviously backfired. He said, “they presumed, as the always do around the world, that the armed forces here and the good people of Gambia were disgruntled, and wanted to be like them, so they wanted to use them as fodder to overthrow a government here in Africa, me, like they did in Libya.” He questioned the source of the weapons used in the attack, revealing that some of the plotters were former soldiers who had been dismissed from the army; one of them, he did not name, was a former commander of the State Guard. The Gambian president appeared stupefied about how Mr. Lamin Sanneh, another former soldier who is said to have led the attack, and who had left the country not long ago, could afford financing an expensive terrorist attack on Gambian soil. The President criticized one embassy, whose name he continues to withhold, adding that the embassy always wants Gambians to believe that they are true friends. He emphasized that the attack cannot even be called a failed coup, in that, not a single Gambian soldier was involved. Investigations are currently going on. Asked to describe some of the weapons, he mentioned what he said are American F16s and other weapons believed to have been deployed by the US Army in Iraq. He swore that the people who helped the attackers bring the weapons to Gambia will pay a high price. Meanwhile, President Jammeh rubbished claims emanating from social media sites that he had posted information online about the attack. He insists he does not subscribe to any social media. This is bothersome that the U.S. is till involved in destabilizing sovereign states. Appalling. Sick sick sick! That state called the U.S. Can they just leave Africa alone? My God! Yahya Jammeh is right! This is a western back failed coup. I didn’t even like Yahya, but with this, I will support Yahya all the way. God Bless you Yahya, God bless you aplenty. Stay in power as long as you want! Thank God for you! Thank Goodness for President Jammeh’s sake that he has good men surrounding him or there is no other way they would have been able to thwart this attack. Gambia and now all of Africa will be aware of Western attempts to overthrow our leaders. Leave us alone, West! And let us decide when and how we want to change our government. Kudos to the Gambian Military. They make Gambia proud. They make Africa proud. The U.S. cannot arrest Mr. Bashir for crimes against Humanity but they want to topple a democratically elected president in Gambia! They love violence, don’t they?